So you’re ready to clean your deck? Once you know what you’re doing and which formula to use, cleaning decking is relatively easy. There are, however, a few common pitfalls. 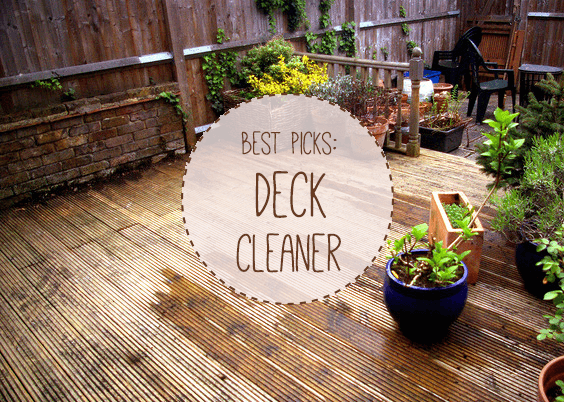 In this article I take a look at some of the best deck cleaners on the market. 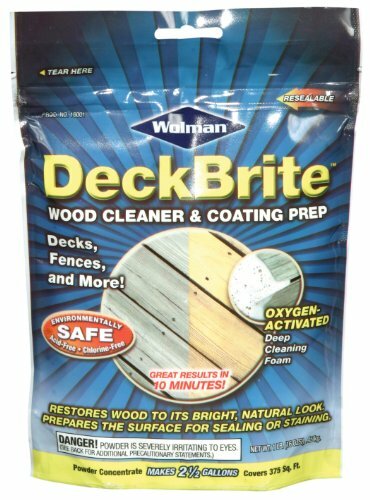 I also spend a little time exploring the difference between deck cleaner and two often-confused products: deck stripper and deck brightener. Hopefully, by the end, you’ll know exactly which product is ideal for you and your beautiful deck. Let’s dive in! Note the unsightly patches of old stain. 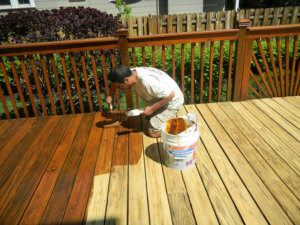 Deck cleaner is most commonly used to prepare outdoor wood for stain or sealer application. Applied through a sprayer, it will remove any unwanted materials and blemishes from the surface of decking (or other wooden furniture). These materials include algae, lichen, fine moss, oxidation patches and weathered stain. Wood that has been cleaned can then be sanded to remove lingering patches of stain before being treated (although if there is a lot of stain then a stripper may be needed). Generally speaking, deck cleaner is unsuitable for straight-up cleaning without restaining. 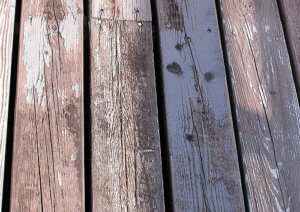 Decking with stain that is intact may suffer from the application of corrosive materials. Many well-known products, including 30 Seconds, are caustic enough to remove small patches of stain. The purpose of stripping deck is to remove past applications of stain. Without stripping you can easily end up with patches of old stain discolouring a newly-painted deck. This is along with an uneven surface. There’s a touch of confusion around the “cleaner vs. stripper” question (I’m sure there’s room for a joke in there but it’s too early in the day). Stripper (or sanding) is only necessary if you want to get rid of large amounts of solid stain. If you’re just cleaning wood that’s dirty, with most of the stain already weathered and worn down, then there’s no need for stripper. This is also usually true if sealer (transparent waterproof protection) has been applied instead of stain. Recently installed and unstained decking that has been left to weather for a few months does not require a stripper. Here, cleaner will also work fine. Finally, it’s also worth mentioning that some products advertised as deck cleaners, particularly in the UK, are gentle enough to be used solely for cleaning. “Some” in the operative word here! If you’re not planning on staining after use, then these are perfectly suitable. The key is in making sure you check the label properly. Now, you might be asking: if stripper does everything cleaner does, why not just gor for stripper? Stripper, as shown in the diagram above, is more caustic than cleaner. For this reason, it’s less environmentally safe and more prone to damaging wood. If it’s not needed, it’s best avoided. Applying stain after cleaning and stripping. To add a further layer of confusion, you can also apply “deck brightener” to decking after cleaner or stripper has been used. Brightener restores the pH of wood to neutral. 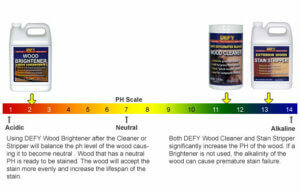 Keeping wood at a low pH can detrimentally affect it. The high alkaline level of cleaners (and strippers) will often lower the pH of decking, which can change its structure in the long-term, making it more prone to warping and rot. Oxygen bleach: Oxygen, or “oxygenated” deck cleaners, have grown in popularity over the last several years. They contain the chemical Sodium Percarbonate, in contrast to the main ingredient in traditional bleach products, Sodium Hypochlorite. These cleaners are much more environmentally-friendly than alternatives. Biodegradable: Because decking is often close to lawns and plant-beds, you want to make sure that you’re not washing off any lingering chemicals into the environment. This is particularly the case if you’re going to be cleaning/staining your decking on a regular basis. Most products are biodegradable now so it’s not a huge worry but it’s worth checking nonetheless. Granular or liquid: If space is a concern you’ll want to opt for a granular or powder product. The powder is added to water before use. 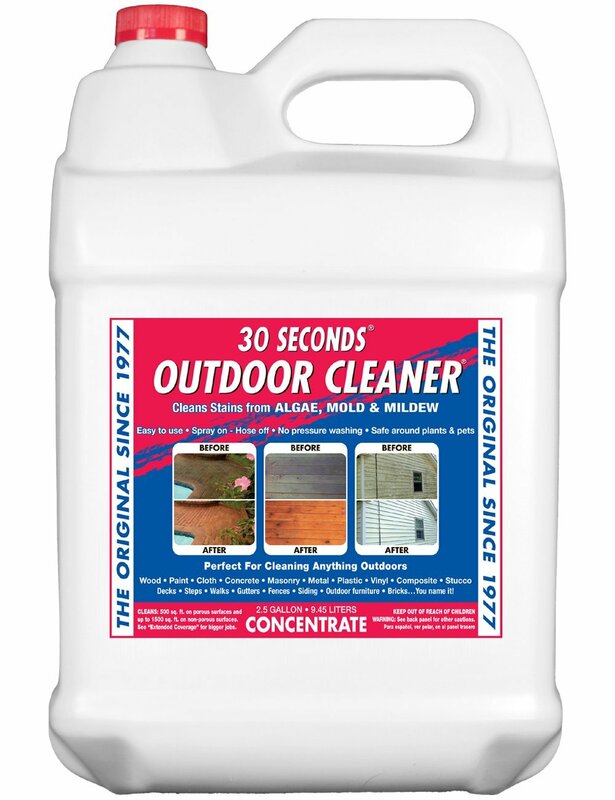 30 Seconds is one of the best-known outdoor cleaners on the market. You’ll see it on the shelves of most hardware stores and gardening centres. Unlike a lot of products that are commonplace, however, this deck cleaner is top-quality. It’s not badly-priced either! The main talking point, as you may have guessed from the title, is the speed with which it acts. It’s completely biodegradable and safe to use around lawns and plants. Whilst its main function is the removal of mould and algae, 30 Seconds is strong enough to remove lingering stain. For this reason, it can be used for preparing heavily-weathered or new wood. It’s best applied through a sprayer, rather than a pressure washer, because it needs to rest on the surface for (you guessed it) at least 30 seconds. The cleaner needs to be diluted with water in a 1:1 ratio and will clean up to 600 sq. feet. It’s suitable for use on composite decking along with plastic and concrete. This cleaner from DeckBrite has an oxygen-bleach based formula and is sold in a powdered form. It’s environmentally friendly and easily stored with a resealable opening. Another noteworthy point is that when applied to wood it forms a foam. This means that it will cling to vertical surfaces like balustrades, side rails and side-decking in a way that liquid cleaners won’t. You can buy it in either 1lb or 6lb lots. 1lb is good for around 250 – 500 sq. feet. As with other products, it is best applied with a sprayer rather than a power washer, due to the need for it to rest on the decking and because of its foaming action. It’s ideal for all types of decking including composite. Wash Safe Composite Deck Cleaner is perfect for those with a composite (plastic and wood) deck. The specific formula used for this cleaner means that its perfectly suited to composite materials. As an added benefit, it does not require heavy scrubbing. Just leave it for the required time and hose. The solution is comprised of surfactants along with a light amount of bleach. The formula is able to penetrate composite wood deeper than other products, thus reaching deep-set mould and the spores responsible for it. It’s unique in the sense that dilution levels can be altered based on the extremity of the stains (just follow instructions). I like Defy products. 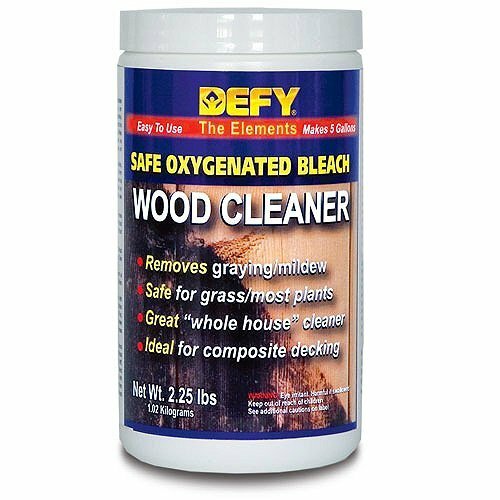 This one is based on an oxygenated bleach formula and is safe for most kinds of plants (always water surrounding plants before use so the cleaner becomes more dilute on contact). It’s designed for use on new and well-weathered wood. As with Wash Safe cleaner, 1lb (this tub includes 2.25 lbs) will account for between 250 and 500 sq. feet. It’s well-priced for what you’re getting and can also be used on aluminium and vinyl. 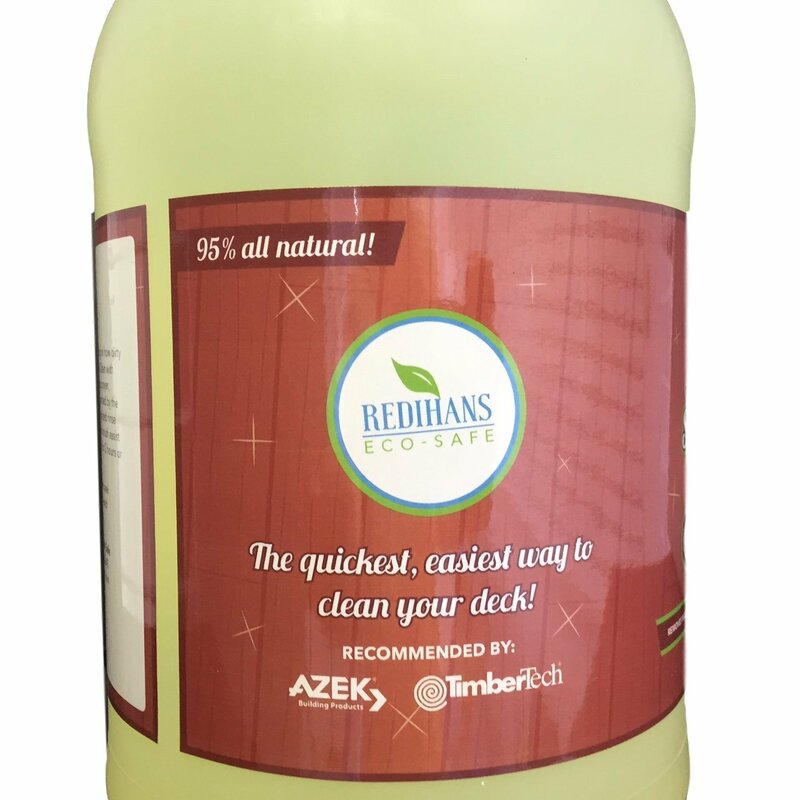 It’s a good multi-purpose cleaner to have for use around the garden because of its adaptability. The tub it comes in also makes storage easy. In the introduction I mentioned deck cleaners that are designed purely for cleaning, that will leave underlying stain intact. They’re more common in the UK, but I thought I would include one in this list too. 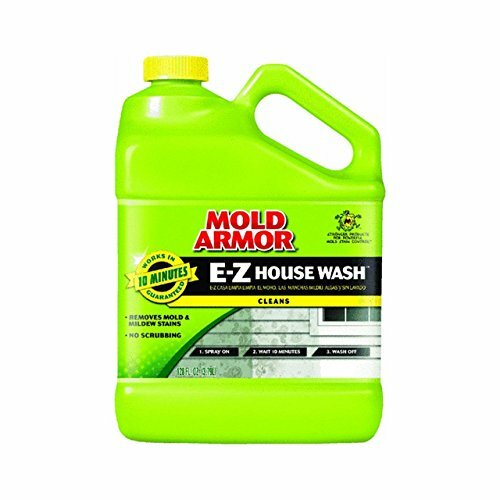 Home Armor House Wash is gentle enough to be used on decking, particularly at a low dilution. There’s no need for scrubbing and this tub will cover an area of 2000 sq. feet. It’s also possible to buy this product with a spray outlet that attaches to a hose. As the outlet it is used, the running water automatically will dilute the solution. Get this if you’re not quite in the mood for staining just yet. What are your thoughts? Have you sampled any of the products on this list? If you have write a comment below and let me know! TidyChoice: An excellent resource for finding cleaners (indoors and out). This is reversed….cleaners are actually alkaline not acidic and will raise the pH, not lower it. The brighteners are the acidic products -used after the cleaners, that lower the pH back down towards neutral. I just wanted to make you aware if it as it can confuse people new to cleaning, brightening and prepping decks for stain or paint. Hey Morgan, thanks for pointing that out! It’s a bit of a silly mistake on my part considering I even included the pH scale diagram. I’ll change it. Thanks again. Thank you for covering our Spray and Clean composite deck cleaner. This continues to be one of our most popular sellers and you covered exactly what sets this one apart; its ability to deep clean. It does! We also wanted to let you and your readers know that we now make it in an easy-to-use hose end bottle: https://www.washsafe.com/products/spray-and-clean-deck-cleaner-ready-to-use-hose-end-bottle PS We are working on a new, improved label but at least this one looks like the other. This blog is very informative when it comes to cleaning. We are in the process of developing a hydroponic cleaner and we’d like to send some your way for trial. We’ll get in touch! Thank you and Happy New Year. Thanks for the update John, I’ll look forward to hearing from you. You can find my email on the about page. Happy New Year to you too!